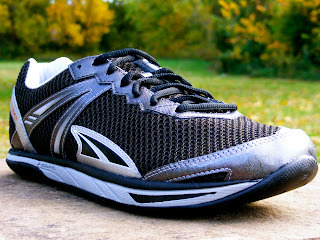 Now that I've logged about 60 miles in my Altra Instincts, I think it's about time that I can offer a review. There are better technical reviews out there on the web (ie...see Runblogger's review for example), so I'll limit this review to two main aspects: 1) why I bought the shoe, and 2) did it live up to my expectations for that purpose. Like many, I've been interested in minimalism for some time, but especially after hearing about the barefoot movement, and the hype surrounding Born to Run. Thus, over the past few years, I've been trying to become more and more minimalist, and do so in a way that is sustainable and realistic -- in other words, not just switching all of a sudden to Vibrams and running 20 miles on pavement. Meanwhile, I had heard about Altra via Run Run Live and Geeks in Running Shoes, and I was very interested in giving them a try. Currently, in my shoe rotation, I have the Kinvara 3, Altra Lone Peak, Montrail Rogue Racer and Rogue Fly, Altra Instinct, and Mizuno Wave Universe 4. I can hear what you're saying..."that's a ton of shoes! Why so many?" Well, A) I like running shoes, and each has a different purpose, and B) Hong Kong is so humid that sometimes it may take 2-3 days for a shoe to be dry enough to run in again! Well, here's how I use each: Kinvaras are for my daily running and some speed work. Lone Peaks are for trail running, especially on dry days. Montrails are for either trail or road, but I mainly use them now for either wet trails or if my calves need some rest. Mizuno Wave Universe are used for races, speed work, and treadmill running. That brings me to the main reason for getting the Instincts. On most week days I run commute to work, going 10-15K via the Hong Kong Olympic Trail from Mui Wo to Tung Chong. This scenic route goes through sub-tropical areas, through old villages, up and around a mini-mountain range on Lantau Isalnd , and then back down towards the coast. In practical terms, this means that two sections of semi-flat running are separated by a section in which 600ft are gained and descended in the course of about two miles...all on concrete! For me, this means having decent cushioning on the steep descents going down concrete is a must. In other words, for my daily running I wanted a minimalist or zero drop shoe that had good cushioning, that would be comfortable, but would also be fairly lightweight. I very happy to say that the Altra Instincts are just about the perfect shoe for my run commute requirements, and I would go so far as to say that they're just about the ideal shoe for people who are looking for an everyday minimalist or zero drop trainer. As others have mentioned, the wide toe box and foot-shaped design makes for a very comfortable fit. I've even done some tempos in them, and while they feel slightly heavy for faster running, they certainly do ok.
Perhaps my biggest surprise is that, compared to running in zero drop shoes with no cushioning or racing flats, say, the Merrell Train Glove or Mizuno Wave Universe (both of which are good shoes for specific purposes), there's probably less overall strain on the calves and Achilles that one feels when running in the Instincts, perhaps due to the fact that it has a smoother , more cushioned ride. On a practical level, this means that, assuming you have built up to it, you can run in them several times per week, or even use them as the "go to" shoe in your rotation, rather than just a form or strengthening tool. Going forward, I'd hope that the Altra folks could decrease the weight a bit, and also add a bit more grip/traction underfoot. Otherwise, I wouldn't suggest dramatically altering an already great shoe. So, I hope this review helps. I'd be happy to hear others' views, or discuss any questions related to Altra Instincts or the zero drop phenomenon! Wow. You can write for a running magazine! I love the water buffalo.